The lounge bar itself is 1930's style with art nouveau influences. Plush velvets, crystal chandeliers, comfortable Sofas and leather armchairs create a decadent atmosphere while lots of candles, warm colours and Mirrors give the venue a special magical glow. Not only do we have a 3am licence but we are just about the only private members' club to have its own dance floor. 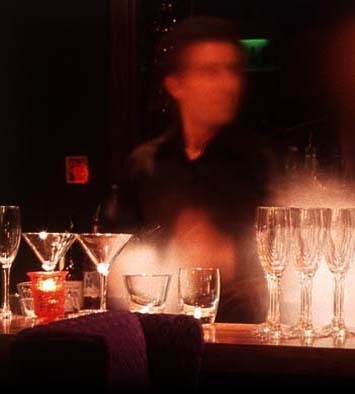 Our unpretentious DJs and bar staff serve up funky tunes and fabulous cocktails, in a club where you can choose to bust a move on the dance floor, chat amongst friends or discuss plot lines after a movie in decadent surroundings rather than feeling inescapably trapped in a monosyllabic meat market. So if you are thinking of celebrating a birthday party, engagement party, anniversary, going away party, celebrating the birth of your newborn, after party drinks, Christmas party or any other reason for debauchery then look no further. The Rex resembles all these things. The Rex also plays host to London's most luscious late nights featuring live music and top DJ's. Paul "Sweetp" Watson has been a resident DJ at The Rex since time began. He is also a successful music producer, writer & performer. Truly an all-rounder in the Global Music Scene with experience that is unparalleled. Sweetp has travelled the globe with his musical knowledge playing sets to unprecedented amounts of people, in some of the best clubs around the world in countries such as Egypt, Russia, Barbados, Germany & Portugal. 2 to 10 piece cover band fronted by astonishing vocalist, "McGoo", whose recent credits include touring with Mike and the Mechanics supporting Phil Collins on his latest world tour. You might also recognise his voice from the McDonalds "I'm lovin'it" advertisement campaign. Guaranteed to compliment any occasion. Whether you require upbeat singalong, or a more mellow background ballad style. Roselie is a soul singer and songwriter with years of experience. Growing up in a musical family- with both parents being opera singers- she started singing at a very early age. At the age of nineteen she moved to London from Sweden to do a music degree at City university, whilst also working on her own material with various Soul, nu-jazz & R n b producers. The last few years Roselie has been writing and recording material both for herself and other artists, and is now working on her forthcoming album. Her style is as she describes "laid-back soul" with jazz and hip hop influences. She has for a while been doing the live circuit in London with her full live band, and is now coming to grace The Rex with her soulful vocals. One for the future & not to be missed. Dj SD has climbed the Dj ranks over the years to become one of the most regular faces behind the decks at nearly every club on the west end circuit. With celeb bookings from Janet Jackson to Samuel L Jackson, from Sir Alex Ferguson to Young Jeezy. SD is well travelled, playing all over the world with residencies in Egypt, Marbella, Cannes and Malia, to regular slots in Liverpool, Leeds and Manchester. SD is also one half of Tracklacers, one of the uk’s hottest music production teams, Re mixing and writing for various chart acts from their London based studios, NewTrackCity. Tyrone “Tito” Forbes is a professional DJ and once club promoter based in South London. Disseminated onto the DJ scene at the age of 14, Tito has been active in the DJ club culture scene for approximately 14 years with a passion for contemporary urban music and party classics. His wealth of experience is impressive and his ability to create exciting mixes is second to none. Emancipating his career in London at various house parties, large family functions and clubs back in 1991, Tito has established himself as one of London’s most versatile DJs. With his cool personality and knowledge of genres digressing from the most up-to-date R&B to 80’s disco, Tito is easily able to establish a good rapport with his crowd generating electric atmospheres in parties. Name recognition has carried this DJ throughout his career and his mission is to please crowds for many years to come. DJ Venus makes it her aim to take party people on a musical journey filled with only the best memories. She celebrates decades of music from the latest Hip Hop & RnB to 80's Soul Classics, Golden Era Hip Hop, New Jack Swing, Dancehall, House classics, Funky House, 70's Disco, Funk, Jazz, 80's Pop anthems, Soca/Calypso, Motown, Rock n Roll/Rhythm n Blues, Ska and more! Whatever music you desire Venus can satisfy your needs using her DJ Mixing Skills and experience gained over many years. Venus has also been a Producer, Song-writer/ performer in the Music business for the past 10 years and now continues to share her experiences as a mentor through Urban Music Workshops taught at primary schools in South London.